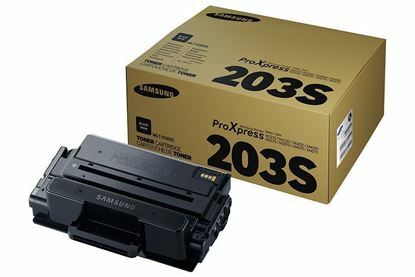 The Samsung SL-M3820ND printer takes the Samsung MLT-D203 cartridges which come with three different page yields. The MLT-D203S is the 'small' capacity which will print for 3,000 pages. Up next is the MLT-D203L which is the 'large' capacity cartridge that prints for 5,000 pages. The best value for money option is the MLT-D203E, the 'extra large' capacity version, which will happily print away for 10,000 pages.